Making custom length RJ12 cables? 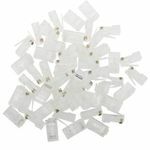 Use these RJ12 6P6C Plug to crimp the ends of your RJ21 patch cables to make sure that your cables are just right for the job. This RJ12 6P6C Plug 5- pack can make up to 25 cables. 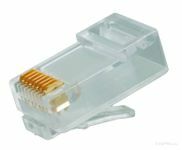 Monoprice Cable Flat Stranded RJ12 6P6C Plug (50pk) . 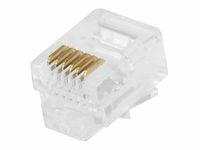 Monoprice 50-pcs RJ12 6P6C Plug for Flat Stranded Cable. Create custom length RJ12 Cables. Work great, can't see any issues. Crimp right, good strain-relief on outer insulation. Should use 6-conductor stranded flat telco cable for easy assembly and proper alignment. 4-conductor cable will fit but is more narrow than the opening so won't line up with pins right and shouldn't be used. Nice price, and great quality. Item arrived on time and was as advertised. 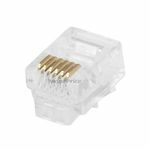 Was not a rj12 plug - outletpc said it was not returnable do not buy as rj12! Rip off as they are not returnable!Repeat! This item does not fit an rj12 plug in. Do not buy as they are not returnable!